Cleveland Cavaliers head coach Mike Brown during the game against the Philadelphia 76ers at Quicken Loans Arena. 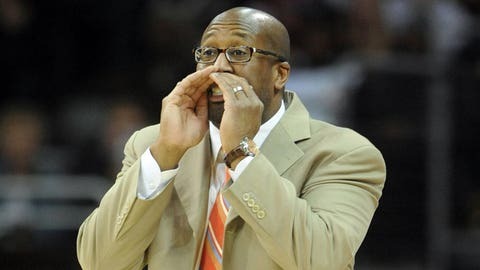 CLEVELAND– Mike Brown walked into the postgame interview room wearing some slick Cavaliers sweats and a large smile. Right away, you knew it was a good night. "We had a whale of a game from a lot of individuals," Brown told the assembled media of the Cavs’ 111-93 rout of the visiting Philadelphia 76ers on Tuesday. Granted, it was just the Sixers. They’re not exactly among the NBA’s most elite. Among the NBA’s most troubled is more like it. But for the Cavs, that hasn’t necessarily mattered. They’ve struggled, and they needed more than a win. They needed a win like this. Brown rattled off the stats. He talked about shooting guard C.J. Miles, who erupted for 34 points by way of a whopping 10 3-pointers. That set a franchise record, breaking the previous mark of eight threes in a game, held by four people (including Miles). Brown also mentioned the likes of Dion Waiters (12 points, career-high eight assists), Anderson Varejao (18 points, 14 rebounds), Tristan Thompson (12 points, 10 boards) and Kyrie Irving (16 points, eight assists). Irving returned after missing three games with a bruised knee, and was efficient as ever in directing an offense that shot just less than 50 percent from the floor. This was a basketball massacre, the type the Cavs (12-23) haven’t experienced nearly enough of these days. Well, at least not on the happy end. "I’ll take that every night," Brown said. "Even though it was stressful, it was enjoyable." All this and the Cavs just traded for a two-time All-Star. That would be none other than small forward Luol Deng. He still has yet to arrive in Cleveland (he’s due Wednesday), but it just seemed like the Cavs were more relaxed, more cohesive, more determined defensively. Those are traits that define Deng. So maybe the Cavs were practicing what life may be like when he’s in the lineup. Not really, but it’s fun to think about what this team can be become if it plays like this when Deng’s on the floor. Deng, who comes from Chicago via the Andrew Bynum trade, is also an expert defender. The Cavs may not have been experts defensively Tuesday, but they were certainly more active and energetic. They held reigning Eastern Conference player of the week and Sixers forward Thaddeus Young to this stat line: 0 points, 0-7 shooting, 0 impact on the game. Sixers forward Evan Turner, the team’s leading scorer at 19.1 points a game, went for (drumroll please) four. He made two of 13 shots. Of course, the Cavs weren’t nearly as effective on rookie point guard Michael Carter-Williams. He scored a game-high 33. But this kid has been good against everyone, and is pretty clearly a top two candidate for Rookie of the Year. And hey, this is the NBA. You can’t shut down everybody, right? Right. What really matters here is the Cavs are feeling good again. They made a good trade, they smashed an opponent, they made their coach smile. It’s what is known as something to build on. And now you’re building with a pretty accomplished dude walking through those doors soon.